Kelvinside Hillhead’s present building on Observatory Road was originally Hillhead Church and after a 1950 union with Belmont Church in Great George Street, now flats, it became Belmont and Hillhead. A further union in 1978 with Kelvinside (Botanic Gardens) Church, now Oran Mor, brought about its present title. The parish was extended when Belhaven Westbourne Church closed. The fine quality of Victorian architecture in Glasgow is now receiving well deserved credit and our building, completed in 1876, is part of that great heritage. It was designed by James Sillars, who modelled it on the Parisian Gothic masterpiece, the Sainte Chapelle. It was built, by local subscriptions, to replace an iron church in the fields to the west of Byres Road. The west-facing front facade has a superb rose window flanked by relief sculptures of angels. Like the original in Paris, there are fine twin octagonal towers and on the apex of the roof soars the delicate third spire or fleche, again in the style of the French original. The whole structure is supported on piles driven through the old mine workings which permeate the area. The church measures 110 feet long by 48 feet wide and can seat 800 people. The roof is 60 feet high, groin vaulted in wood and unsupported by any internal pillars. The Baptistry, on the left of the entrance, was added in 1926. The marble font has carved shields on its eight sides showing Alpha, Omega, IHS, a Celtic cross, Chi Rho, a dove, a Maltese Cross and a hand symbolising the Trinity. The font is surmounted by an ornate wooden canopy counterbalanced to enable it to be raised when the Baptistry is in use. The wrought iron lectern is from the former Kelvinside Church. The attractive small stained glass windows in the alcoves at this end of the church date from 1928. Jesus with the Rabbis in the Temple (by Cottier, 1903). Joseph, holding his staff, stands in the background and round the main picture are the heads of Moses, Joshua, Samuel and David. Jesus talks to the women of Samaria at Jacob’s Well (by Cottier, 1903). Round about are the heads of the prophets Isaiah, Jeremiah, Ezekiel and Daniel. Jesus blessing the little children (by Sir Edward Burne-Jones, and built by Morris 1893). The lower panels show angels holding a scroll. Christ protesting the truth to Pontius Pilate (by Shrigley & Hunt 1893). The groundwork consists of pomegranate leaves and fruit. The prophets who spoke of the Messiah are also depicted: Jeremiah and Daniel on the left, Ezekial and Isaiah on the right. Jesus refusing the request of James and John to call down the fires of heaven on a Samarian village (by Cottier, 1893). This symbolises the desire to save life, not destroy it. The background is of lemon branches, Alpha and Omega, sunflowers, a cross and angels. Jesus at the grave of Lazarus with Martha and Mary (by Cottier, 1893). A Jew points to the grave. Also shown are the four evangelists and cherubs holding scrolls of Faith, Hope and Charity. Jesus turning water into wine at the marriage in Cana (by Cottier, 1893). Appropriately, the background is of vines and grapes. The ship is to carry the faithful over the sea of life. The triumph of Right and Justice over the powers of Evil (by Meikle, 1917). The window was presented in memory of Lt William Teacher. The Pulpit is of Austrian oak in late Gothic design, erected in memory of Dr David Strong, first minister of Hillhead Church. In the alcove to the left is the Book of Remembrance from Kelvinside Church and the Charred Cross of Bangladesh, brought from India by the then overseas partner. The Communion Table, by MacGregor Chalmers, 1921, is made from Rochetta Marble. A winged man with a book, symbol of St Matthew, and a winged lion, symbol of St Mark. St Andrew’s and St George crosses on a background of the Thistle and the Rose. The Burning Bush, St Constantine and the bell, fish, bird and tree of the arms of Glasgow. The nails and crown of thorns with the monogram IHS, Jesus Hominum Salvator. Symbols of bread and wine representing Communion. The pelican feeding her young and the phoenix rising from the ashes symbolising immortality and resurrection. Oak and acanthus scrolls representing faith and virtue. The eagle and ox, symbols of St John and St Luke. The bronze eagle lectern was a thanksgiving for those who returned from the Boer War. 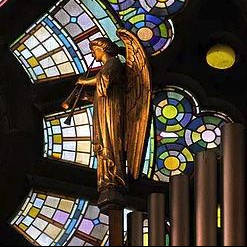 The organ, in the gallery, is a magnificent example of the work of Henry Willis, built in 1876 and enlarged in 1930. It has three manuals, 48 stops and 24 couplers.